The Uttar Pradesh Anti-Terrorism Squad (ATS) got three days’ transit remand of Nishant Agrawal, the BrahMos engineer arrested for allegedly spying for Pakistan’s Inter-Services Intelligence (ISI), from a Nagpur Sessions Court on Tuesday. Police in Nagpur with scientist Nishant Agrawal (face covered) who was arrested in a joint operation by Military Intelligence, Uttar Pradesh and Maharashtra police on alleged charges of spying for Pakistan's intelligence agency ISI and other countries on Oct 8, 2018. Agrawal was arrested from Nagpur by a team of UP ATS in an operation conducted with the Maharashtra Police and Military Intelligence on Monday. He was booked under the Official Secrets Act (OSA). 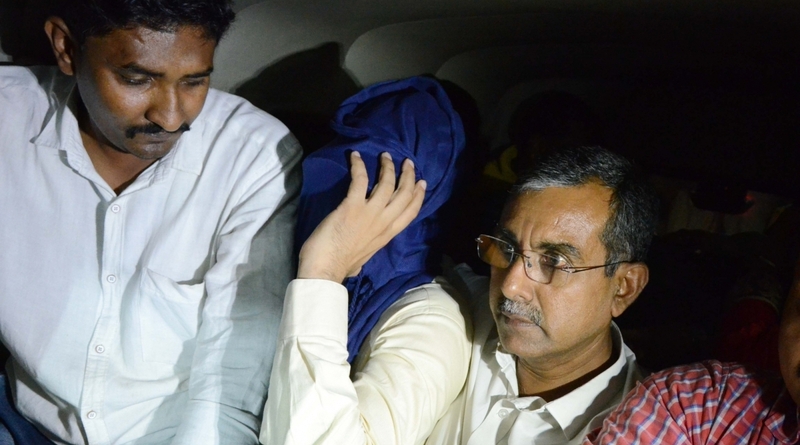 Agrawal was presented before the court today for the transit remand. Agrawal will soon be taken to Lucknow for further investigations into the sensitive case. Described as a brilliant engineer, Agrawal was working for the last four years in the BrahMos Aerospace Pvt Ltd (BAPL), an Indo-Russian Joint Venture. Authorities are probing if Agrawal had passed on sensitive information about the BrahMos supersonic cruise missile to his ‘handler’ suspected to be a Pakistani. He came in the radar of the Military Intelligence after authorities received a tip-off from a man arrested in Noida. Police began monitoring fake Facebook accounts of women originating from Pakistan in the name of women to “honey-trap” key officials working in sensitive defence-related set-ups in India. They found two of the fake IDs chatting with Agrawal. The teams also searched his BMAL office and from another location recovered an old laptop which is being examined to see if it contains anything objectionable. Besides the operation in Nagpur, the UP ATS also raided two other unidentified persons in Agra and Kanpur and seized their laptops. Agrawal hails from Roorkee in Uttarakhand and had been recently awarded the ‘Young Scientist Award’ for the year 2017-18. He had got married earlier this year and had been living in a rented house in Nagpur’s Ujjwala Nagar. The BrahMos Missile Research Centre is involved in making certain critical components for the BrahMos missile, which is the world’s fastest cruise missile and is the only one of its kind that can be launched from land, sea or air. Developed in a joint venture between the Russian Federation’s NPO Mashinostroyeniya and India’s DRDO, the medium-range ramjet supersonic cruise missile is nuclear-capable and is in service with the Indian Army and the Indian Navy. The Indian Air Force is seeking to induct air-launched BrahMos, tests of which were successful using a modified Sukhoi Su-30MKI in November last year.